Welcome to the fifth Seance25 newsletter of the harryprice.co.uk website. I decided to hold back the June issue and combine it with July's as I am pleased to say that lots of new things are now on the site and it would make it something of a bumper issue! As always comments on the site and this newsletter are welcomed on the usual mailbox@harryprice.co.uk e-mail. Since last time I have received a lot of interest in the website and several new additions to the distribution list for which I am as always very grateful. Special mention here to Richard Lee Van den Daele (spelt it right this time, Richard!) for his contribution of more photographs for the website (see below) as well as a whole mass of information about the 1970s Croome-Hollingsworth investigations of Borley, including correspondence and newspaper cuttings, some of which is now on the site. Also Eddie Brazil's support and encouragement for all aspects of the site deserves especial mention too. Ed and I spent another pleasant day at Borley last month as part of Eddie's survey of the history of Borley Church, of which more below. 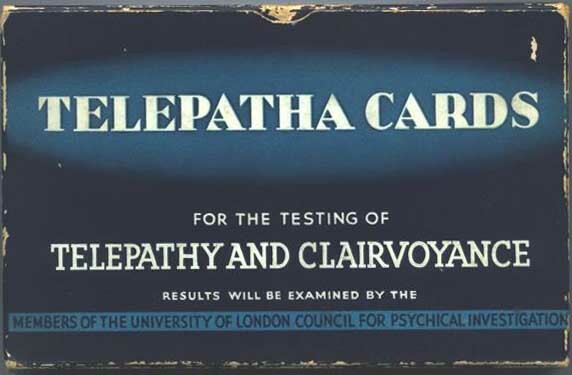 At the beginning of June I received a request from Doris Plank of Redakteurin Information who is currently carrying out research for an Austrian television programme on the 'Poltergeist Girl' Eleonore Zugun whom Harry Price brought to London in 1926 for a series of experiments at his newly opened National Laboratory of Psychical Research. 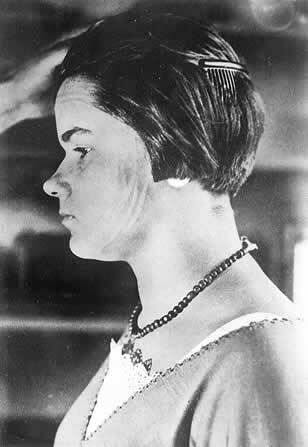 I have supplied Doris with the photographs she needed of Zungun's phenomena and the séance room at the National Laboratory which she needed for part of the programme. More information about the Austrian TV programme will be included in a later newsletter. An interesting contact in connection with one area of the site that has seen substantial development over the past month or so was with Mark Steadman of the Post & Tele Museum, a communications museum in Copenhagen. Mark and his colleagues are preparing for an exhibition next year which focuses on airships and zeppelins, and in particular how these dirigibles affected ordinary peoples' lives. Mark's enquiry was in connection with the séance which took place at Harry Price's National Laboratory in October 1930 when the trance medium Eileen Garrett apparently made contact with an entity who claimed to be Flight Lieutenant Irwin of the ill-fated R101 which had crashed in France two days previously. I was able to supply Mark with some images of the séance room at Queensbury Place where the sitting took place which will be included as part of the exhibition. 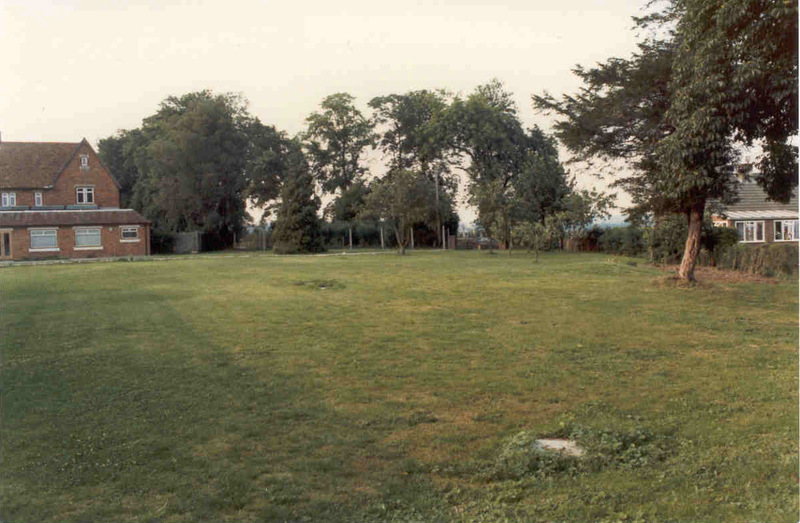 As mentioned in the previous newsletter, Richard Lee Van den Daele has kindly supplied copies of a series of photographs which he took on the former site of Borley Rectory in 1984. These are now on the site in a short article in the Modern Borley section. Richard's photographs, taken with the permission of the owners of the Rectory Cottage show exactly what the 'most haunted house in England' looks like today. Richard has also contributed scans of the 1938 Moger Inventory of the Rectory which is a fascinating document of what the building and its grounds were like at the end of Harry Price's year long tenancy. One would have to go further back than the 1980s to chart the beginning of Eddie Brazil's interest in the Borley case, to the beginning of the '70s to be precise. 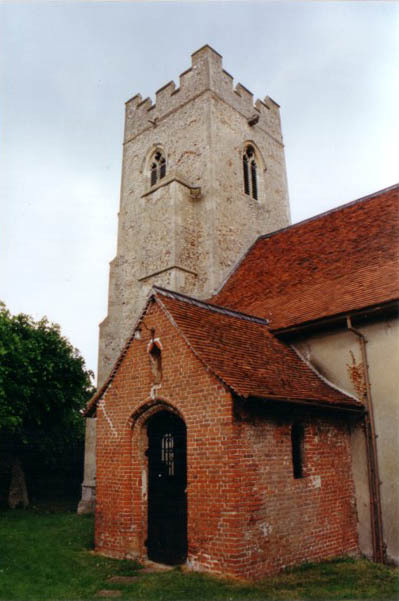 In the intervening years Eddie has made many visits to Borley and has begun a survey of this country's most famous haunted ecclesiastical building with the first part of a series of essays specially for the website. In A Brief Introduction to the History & Haunting of Borley Church - Part One, Eddie looks at the architectural and social history of Borley Church. 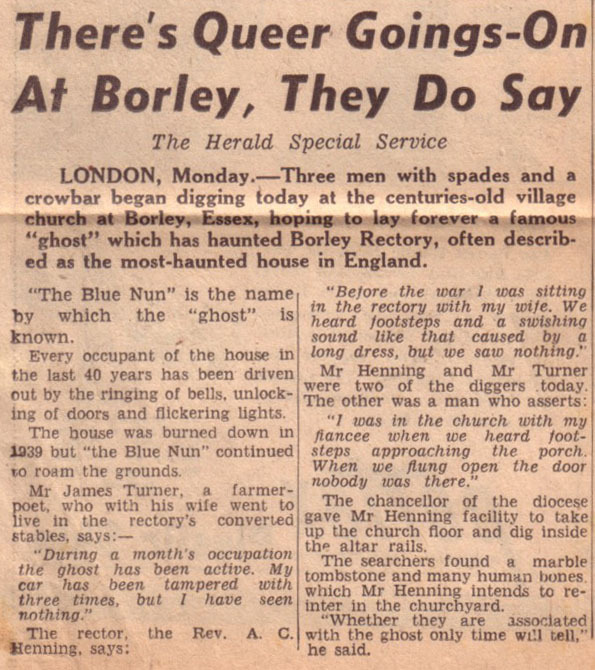 The second part of this essay will focus on the paranormal activity which has been recorded in and around the building in the decades following the demolition of Borley Rectory itself. An opportunity has arisen for the serious paranormal researcher to hold an all night vigil at Borley. Because of the delicate nature of 'ghost hunters' at Borley we can only give brief details at the moment. However, those interested will be given access to some of the sites connected with the story and the use of a temporary base room/HQ where you will be able to conduct your investigation. If you are a dedicated paranormal researcher and would like to spend a night at the site of 'the most haunted house in England' please contact either Paul or Eddie on mailbox@harryprice.co.uk at harryprice.co.uk for further details. The final mention of Borley in this newsletter concerns a new section of the Modern Borley page which is an attempt to bring together the many reports of Harry Price's most famous investigation which have been reported in the Press down through the years. The Borley Press Album is a work in progress which with the help of visitors to the website will expand in the months to come. Anyone who has cuttings related to Borley is invited to send a scan to the site and any contributions will be gratefully received and credited. The section of the website which has seen extensive development over the past month and a half has been that devoted to Harry Price's work in the field of spiritualism and organised scientific psychical research. The Séance Room covers the many famous psychics that he encountered during his Honorary Directorship of the National Laboratory of Psychical Research as well as the activities of Price's organisation itself. Their are now articles on Helen Duncan, the materialising medium whom Price exposed as producing fraudulent phenomena through a revealing set of flashlight photographs (all of which are on the website); Stella Cranshaw (Stella C.), Harry Price's first real psychic discovery; Price's association with trance medium Eileen Garrett; the great Rudi Schneider and finally the National Laboratory itself, which has online versions of articles from Price's own British Journal of Psychical Research and Price's own E.S.P. cards, the "Telepatha" Cards which are shown at the top of this page. A fascinating record of Harry Price is the 10 minute talking film Psychical Research which he scripted and made for Movietone News in 1936. The film shows Price in the rooms of the National Laboratory at 13, Roland Gardens, South Kensington, giving a potted history of his activities as well as showing some early books on psychical research and some interesting artefacts from his museum which include trick slates and the contents of Joanna Southcott's famous "box" which price opened at the Church House, Westminster in 1927. I would dearly love to include the film on the site but the costs of acquiring a licence for it are astronomical so I have added a complete transcript to the website as well as some scans of the various books which Price discusses during the film. That's about all for this update for Harryprice.co.uk. The next issue issue of the newsletter will hopefully be out around the middle of next month.